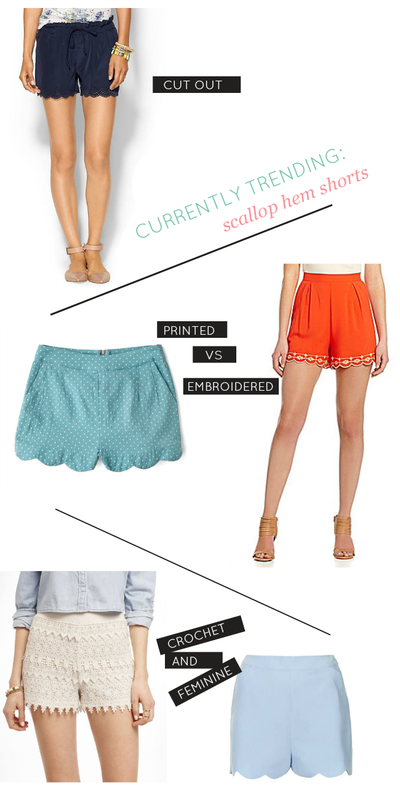 Since then, I've had my eye on scalloped hem shorts. I've been drawn to looser fitting shorts this summer since I'm a) no longer 16 and b) find them to be, in most circumstances, much more appropriate than my favorite Levi's cut-offs. And scalloped hems are just the way to make ordinary loose fitting shorts just a little more fun and a little less mom-like. The first pair are my favorite! Super cute...I really love that top Navy Cut Out Pair!! I'll have to keep my eye out for some.